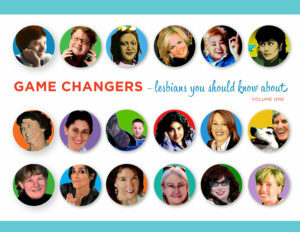 Home » Final Push for Lesbian Game Changers! 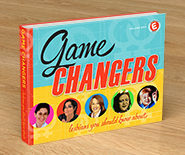 ‘Game Changers: Lesbians You Should Know About’ is an important book about lesbians who made significant contributions to LGBTQ culture over the past 30 years. I’m creating this resource book for students as a result of The FAIR Act, a recent law that requires the inclusion of LGBT Studies in the California public school curriculum. Copies of the book will be donated to libraries and schools throughout the Bay Area. We Raised $10,000 in Our 1st Indiegogo Campaign! HUGE THANK YOU to all who participated in our success. We are encouraged and confident that we will be able to raise the additional $10,000 needed to reach our goal! Stay tuned for upcoming “Final Push” campaign coming in August! We have new cool perks and a target date to get them in your hands by December! Today’s LGBTQ youth need to know who their female heroes are, and on whose backs their newfound freedom is based upon. I think its safe to assume that soon there will be a poster of Harvey Milk in most California classrooms. With all due respect to history, while Milk helped make real changes to the civil rights laws, there are also specific women who provided cultural contributions that allowed the LGBTQ community to THRIVE. I am featuring many key women who came out early in their lives and forged a path for the future of LGBTQ culture. We need to celebrate this important history, and more importantly, let it be more widely known for the sake of our community, our kids and our grandkids. This book will not only educate about the impact many lesbian’s have made on LGBTQ culture, but it is intended to INSPIRE young people from all walks of life to stand up for what they believe in. An excerpt from the introduction: “Every single woman featured here changed the world in some way. Each worked hard and believed in herself, never backing down against a prevailing culture filled with discrimination and bigotry. They all stepped up, followed their hearts and ultimately helped pave the way for acceptance of the LGBTQ youth of today. What Exactly is Game Changers? Created as a richly-designed interactive package, this large format book will dedicate six pages to each woman featured. There will also be a pull-out Game Card which highlights ‘fun facts’ about each woman. 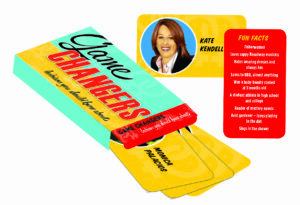 This deck of cards is a great way to encourage people to interact with the women in the book. Additionally there will be a Resource Guide section as well as photos and bios of ‘Other Notable Lesbians’.